View of “Berlinde De Bruyckere,” 2016. Before you get to the great roan bodies in “No Life Lost,” you have to encounter them flayed out and drawn in pencil and tremulous watercolors—cloud black, dirty sunset pink—as if to resemble vaginas. The relationship between human and horse is the only one in nature that rivals that of a man and a woman for sheer struggling power and the mortal frustration that results. A horse, after all, must be broken. As a child, the painter Francis Bacon, a perennial analogue for De Bruyckere’s more cruciformal tendencies, was whipped by his father’s grooms the same way they whipped his father’s racehorses. His father was likely afraid of the young boy’s grace. I can’t say whether it is crueler to treat a human like a horse or a horse like a human, as De Bruyckere does. 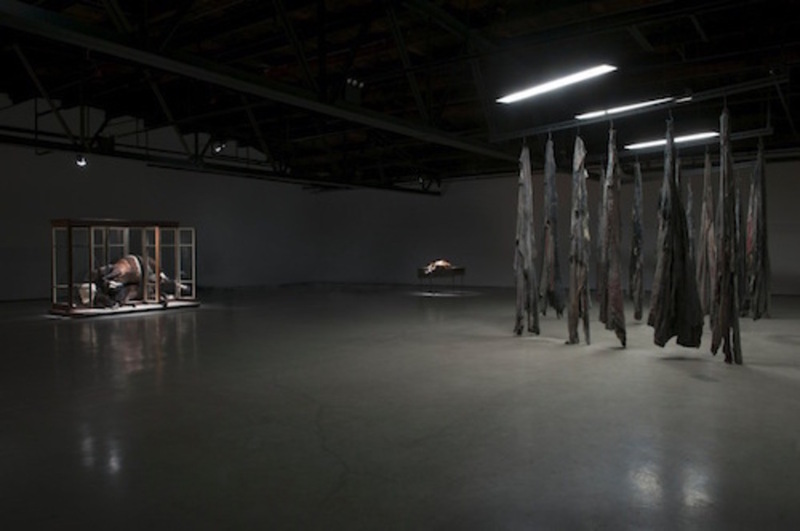 I can say that the show’s final work, Kreupelhout – Cripplewood, 2012–13, a giant red elm meant to embody both the old woman in J. M. Coetzee’s story “The Old Woman and the Cats” and the forever-young martyr Saint Sebastian, is a resting place, generative after excess decay. Think of the coffins that could be made from it, the armoires, the plinths, and the pyres. Think of the bedframes. We live to burn another day and one day not to suffer, or be sorry, at all.